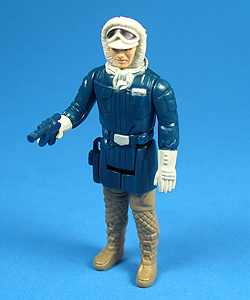 Originally this figure was named Han Solo (Hoth Outfit) on The Empire Strikes Back card back, only to be changed on the Return Of The Jedi card back to Han Solo (Hoth Battle Gear), and remained so on the Tri-logo card as well. Comments: Have you ever noticed that the word ?outfit? doesn?t really sound all together manly? A fine example is the original name on The Empire Strikes Back card back for the Han Solo (Hoth Outfit) action figure. Though you can count on the fact that the name didn?t actually affect sales, Kenner must have realized the power of a name when they renamed it ?Han Solo (Hoth Battle Gear)? on the Return Of The Jedi card backs. Either way, the figure?s (sort of) working holster made this version of the scoundrel very cool? even if we all wish to disregard the ?outfit? thing completely? Major Variations: Though all vintage figures have minor variations, the Han solo (Hoth Outfit) action figure is riddled in paint variations, has a few minor sculpt variations, as well as one fairly significant, but at this point, seemingly very rare major mould variation. Unlike all the countless leg colour variations on this figure, a version with legs moulded in tan plastic with the blue of the jacket painted on has surfaced. This is a major discovery, that though speculated for about a year, which was only recently documented. Though there is little doubt that many more will surface, at this time there are only two documented examples. Discovery of the Moulded Legs Han solo (Hoth Outfit) came, unexpectedly and -despite extensive research- completely by chance, after the acquisition of this odd error figure (pictured above) which sports both a moulded and a painted leg. This error serves as the perfect comparison of both the versions, much to the benefit of the vintage Star Wars collecting community. However, finding the Moulded Legs figure based solely on jpg images is a nearly impracticable task, due to the similar tone it shares with a few of the painted variations. 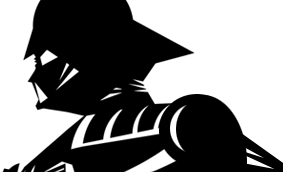 Even though it is certain more than the two figures currently documented exist, without any carded examples found it is impossible to say when this version was produced and for how long. Therefore, it is at this time impossible to state how rare this version is.